I reckon only a handful of us understand what giving is. A lot of people have read somewhere in some website or in the pages of some book that we should all give more than we receive. But let’s face it, do we really feel that way? After all, getting a car feels much better than giving one away. Receiving money feels much better than giving it. I think we should really think about this though. I was walking along the street the other day when I realized that we are nothing without giving. I am not much of anyone without sharing my thoughts on this blog and youtube channel. A person isn’t worth much without a purpose and a role. In a way, the only way to receive is to give. You must give something of yourself whether it be to your job, family, friends and loved ones. Yet, most of the time we get lost in calculating how much we get back. 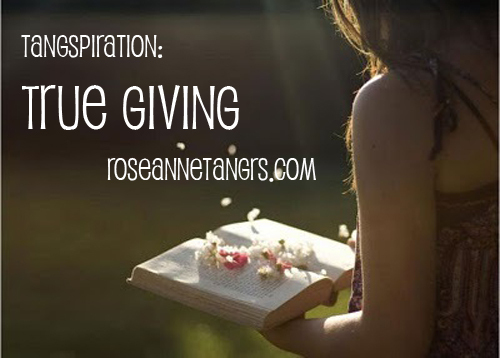 We got lost in what I call the mathematics of giving and we all need to do this: Give and Expect Nothing in Return. Because that’s true giving and that’s the only kind of gift that you’d want given to you. Give because it makes you happy to give, not to receive. I know some people who try to squeeze every last drop out of their boyfriends before they get married because they think they’ll get nothing after it. I know some people who get upset at the balance of giving and think that they feel that they’ve given too much but have received nothing. I even know some people who are too afraid to give because they think they’ll be taken for granted and dumped on the side for being “whipped”. Did you know that giving takes many different forms and that your perception of giving might differ from somebody elses? People show their love in different ways. You might feel that when your boyfriend doesn’t text you back immediately, that he’s not doing his part in the relationship. Little did you know, he’s probably busy planning the next big date for the both of you. Perhaps texting just isn’t his thing, but he knows exactly what to say when he’s sitting next to you. People give differently, you just have to be aware of it. To be honest, I’d only want someone to do something for me not because I asked them to do it, but because they truly want to. That’s the only act I care about. Don’t be afraid to give because you think you’ll get nothing in return. If giving because it makes you feel good isn’t good enough, then know that it’s just the natural order of things to receive. The more time and effort you put into your homework, the higher your grade will be. The more attention you give to your puppy, the more your puppy will love you back. The more water and sun (within good reason) you give a plant, the more fruit it will produce. It’s just the way things work. Giving is like planting a seed. At the end of the day, the more you give, the more you receive but receiving should never be the end goal of your gift. What’s the best thing you’ve done for someone? You might feel that when your boyfriend doesn’t text you back immediately, that he’s not doing his part in the relationship. Little did you know, he’s probably busy planning the next big date for the both of you. Personally, I don’t like to tell people like straight up, “Oh. I did this for you. or I did that for you.” because I have always found it kinda boastful whenever I heard someone else say those things. I mean, good intentions or not, I feel if you do something good for someone, your own self-satisfaction is enough. I don’t need the praise and attention that most people crave. Thanks love 🙂 that’s true! Hi Roseanne, how do you handle people who constantly remind you of the good things she has done for you? I am struggling with my aunt who claim that she loves me and supports me financially in my college. But the thing is that I am so stressed since she is very critical to my behavior. She claims that every word comes out of her mouth was of her best intentions. But I don’t think so. I understand that she has every right to help me grow as a better person. But I did not agree with her that I have been ungrateful towards her and other relatives who supported me financially. What would you do if your relative accuses you of being wrongful while you disagree? How would you react? Consider that you relative thinks that she is always right and truthful. Hi Roseanne, thank you so much for your advice and I really appreciate it. I agree that we should focus on our thoughts and emotions rather than try to change the external factors. You are so smart and understanding. Thank you for all these and keep up with your good work! By the ways, I love your videos, especially the reviews, they really help! Thanks!